Throughout the seven editions of this book, Harrower has successfully deconstructed the process of laying out newspaper pages. For journalism students and professionals alike, countless designers have used this book to learn how to design and improve their skills as visual communicators. Harrower’s unique voice and quirky sense of humor are still very much alive in the seventh edition. Entire book has been redesigned to make it easier to navigate, read, and follow. 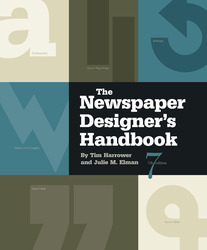 The choice of colors, type, and general layout give the seventh edition a modern, clean look and feel. New and award-winning pages have been added to show a range of design solutions—from the most basic, traditional layouts to the more advanced, conceptual creations. They are all meant to inspire and illustrate different visual possibilities. Troubleshooting questions are now integrated in appropriate spots within each chapter instead of grouped at the end. New co-author Julie M. Elman has worked as a photojournalist, picture editor, and designer at a handful of newspapers including The Charleston Gazette (W.Va.), The Knoxville News-Sentinel, and The Virginian-Pilot (Norfolk, Va.). Humorous writing style helps make the concepts memorable. Easy-to-understand, detailed, and funny explanations teach students how to piece together pages from scratch. The always-popular quizzes have remained in the book—intact! Answers are in the appendix. Introduces students to the building blocks of newspaper design: headlines, texts, photos, cutlines, and more. Tim Harrower is a renowned journalism educator and consultant.